Over the past 3 weeks, central banks around the world have made a number of comments that have affected rate hike expectations. 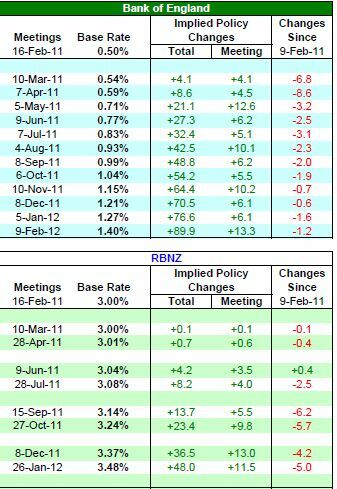 On Jan 27th, I showed where rate hike expectations were at the time and since then a number of interesting changes have occurred. 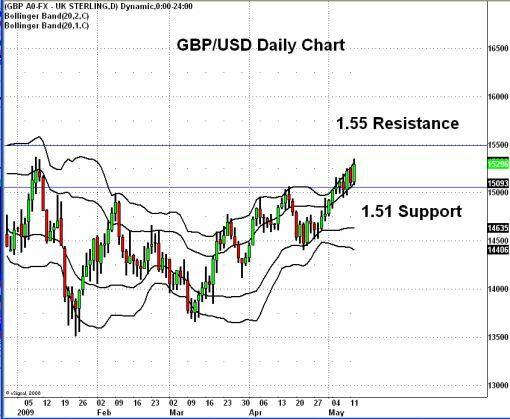 British Pound: Will it Break the Range? For the past four trading days, the British pound has been stuck in a 200 pip range against the U.S. dollar and a 115 pip range against the Euro. However the bottom of the range in both the GBP/USD and EUR/USD have been broken, leading currency traders to wonder if the larger range will be tested as well. For the GBP/USD, this would be a break of the 1.6750 or 1.60 level and for EUR/GBP, the levels to watch are 85 and 87 cents. Despite the 1 percent drop in the EUR/USD today, the GBP/USD has been relatively unchanged. One month GBP/USD volatilities have fallen to the lowest level since September 2008. 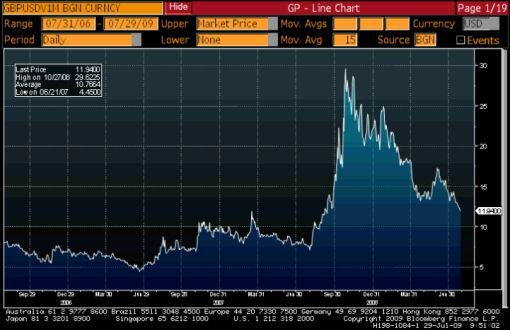 Such a sharp contraction in volatility usually suggests that a breakout is imminent. The only question is, in which direction. Here are some sound arguments in favor of an upside or downside breakout. We finally have a meaningful pullback in the currency market and I strongly believe that rather than being a top, this is an opportunity to add to short dollar positions. 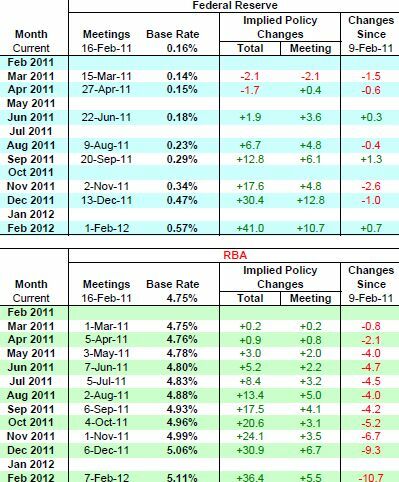 The currencies that I am the most bullish the dollar against are the Australian dollar and British pound. Australia reported hot GDP numbers last night and the combination of Chinese demand and soaring gold prices will add further fuel to the Aussie’s move. New Zealand is also a big commodity producer and they recently got taken off the negative watch list by Standard and Poor’s, which should pave the way for further gains. As for the British pound, service sector PMI moved back into expansionary territory, which is the first signal that the U.K. recession may be over. When you compare these solid figures to U.S. data, it is becoming increasingly clear that the U.K. could leave the U.S. in the dust. The higher probability opportunities however are in the crosses because the rally in the dollar could last for another 24 hours. In the AUD/USD for example, the uptrend would remain intact as long as the currency pair does not close below 80 cents. In the GBP/USD, the level to watch is 1.6150. 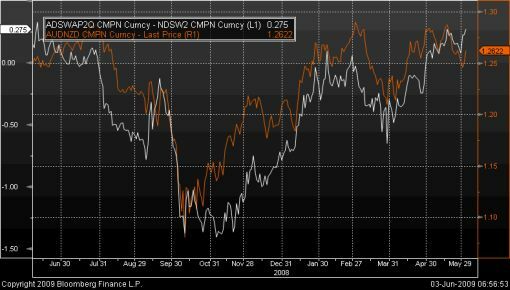 Fundamentally, the Australian dollar and British pound should also outperform the Euro because of the prospect of unconventional measures from the ECB and the trouble that is brewing in Central Europe (Latvia had 4 failed bond auctions). Unlike Australia, the Eurozone is not benefitting from the shelter of rising commodity prices and the economy is still suffering. Many people have criticized the U.K. government’s response to the financial crisis and recession but U.K. officials may be having the last laugh. The latest string of economic data has been surprisingly strong. There are signs of stabilization in both the housing and labor markets. Last week, the Bank of England increased the size of their Quantitative Easing program to ensure that the recent improvements will continue. According to the RICS House price balance, new buyer inquiries were the strongest in 10 years. Housing market turnover was still low, but that may soon improve as well. The BRC retail sales monitor also jumped 4.6 percent. As a leading indicator for the broader retail sales index, the data suggests that consumer spending improved materially in the month April. The early release of the employment numbers helps to explain why consumer spending has picked up. Although the unemployment rate hit a 10 year high, the number of people claiming unemployment benefits has decreased significantly while earnings saw a smaller than expected decline. The Bank of England will be delivering its Quarterly Inflation report tomorrow. 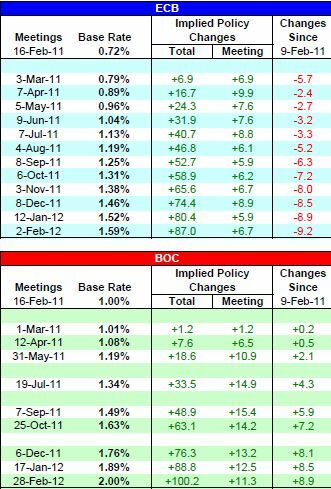 A more negative tone is expected given the comments made following the last monetary policy decision. This should lead to a correction in the GBP/USD, but that should be looked as an opportunity to add to long positions. I expect any retracement in the GBP/USD to be limited to 1.51 and I am still looking for a move to 1.55. 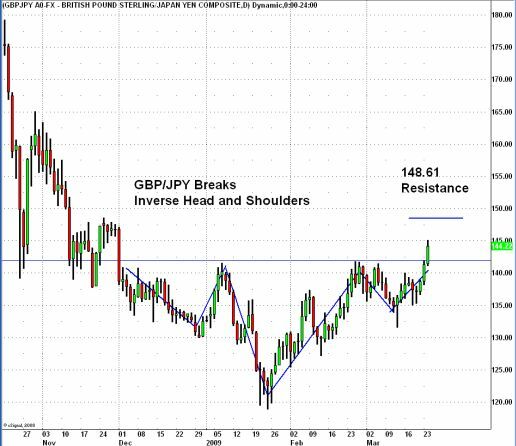 For you technicians, hopefully you have caught the major break in GBP/JPY today.